HALLOWEEN TAG! | RAWR BOWS. HAPPY HALLOWEEN EVERYBODY!! I was tagged by the lovely Kyla Delilah (check out her blog here, I'm sure you'll love it!!) to do the Halloween Tag. Right now it's 10pm on the 31st of October so I would say I'm quite last minute but better late than never! 1.What are your favourite Halloween movies? To be honest, I haven't seen many but I love the Halloweentown movies as they are Halloween-themed but they are not scary at all so they are perfect for me because even Harry Potter scares me so I can't watch scary movies. 2. 1-10, how much do you love Halloween? Maybe around 6-7? I do like Halloween as I have an excuse to eat candy and I like seeing all the decorations in the stores and around the city but I've never celebrated it properly so I feel I don' really know whether I like it that much or not. 3.What is your fondest Halloween memory? As I said before I've never celebrated Halloween but I remember two or three years ago One Direction went to El Hormiguero (a Spanish talk show) on the 31st and some kids came to my house to ask for candy and I got so annoyed because I was fangirling and they interrupted me. It was very rude. Plus I wanted all the candy for me. 4. Have you always been a Halloween lover? Nope. I didn't care about Halloween at all until a few years ago. 5.Favourite Halloween decorations? Pumpkins definitely. I love pumpkins, I think we should use them as a decoration all year around, they look so cosy and pretty. I really like white pumpkins as well, they look very girly though so I guess it's more very Halloween-y. 6.How do you get in the Halloween spirit? Literally all I do is eat candy and watch movies. I also tried the pumpkin spice latte from Starbucks last year but I hated it. 7.Favourite Halloween/Fall sent? I love how it smell after it's rained. I wish there was a candle or a body spray that smelt like that. 8.Favourite Sweet? Well, taking into account that last week I bought a huge bag of Maoams and they are all already gone I think I would have to go with Maoams. 9.Vampire, Zombies or Werewolves? Not a fan of any of them but if I had to choose one I would choose werewolves as they are not as creepy as vampires or zombies. 11. Do you believe in ghosts? Nope... and now is when one appears in my bedroom and scares the crap out of me. 12. Least favourite costume? Cat or Catwoman. Like common, really? It's Halloween, at least dress up as something slightly scary or just something that is not a cat actually. Be a bit original. 13. Do you decorate your house? I decorate my room but not my flat as I cannot be bothered. And that's all! Again, thank you Kyla for tagging me! 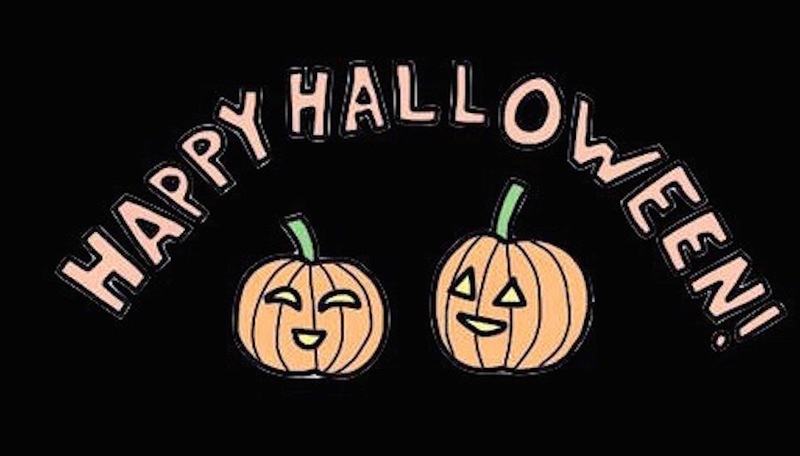 I'm not tagging anyone as this is a Halloween tag and Halloween will basically be over in less than 3 hours but I hope you all have fun tonight, whether you're going out with your friends or staying at home watching movies!